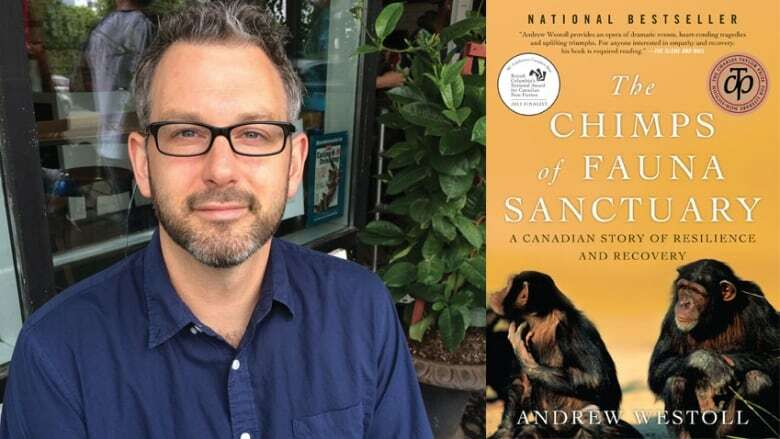 Andrew Westoll is the author of The Chimps of Fauna Sanctuary, which is on the Canada Reads 2019 longlist. The Chimps of Fauna Sanctuary is on the Canada Reads 2019 longlist. The final five books and the panellists defending them will be revealed on Jan. 31, 2019. The 2019 debates are happening on March 25-28, 2019 and will be hosted by Ali Hassan. In 2014, Westoll spoke with CBC Nova Scotia's Mainstreet about writing The Chimps of Fauna Sanctuary. "I have a background in primatology. I once spent two years studying wild troops of capuchin monkeys in the upper Amazon Basin, but I left science and became a writer. I always heard that there were chimpanzees in my own country living in a place where there's snow on the ground for four months of the year, and I thought this was fascinating. At first it was just pure interest. Then, when I learned their stories and learned what they'd been through, it became much more of a personal quest to write this book and to get their stories told." "We know that they're so emotional. We know that they're incredibly social, just as social as us. There's a famous saying 'one chimpanzee is no chimpanzee.' You need a group of chimpanzees to have real chimps. I feel like speaking about this stuff to do with our closest cousins is the easiest way to start these conversations." "Over the last hundred years we've done some pretty incredible things to our closest evolutionary relatives. We've injected them with human viruses. We've used them for space race experiments, where they went through blunt trauma. We've kept them in captive and in cages, we've taken them from their mothers just days after they'd been born. "I feel like the debt we owe chimpanzees is not too dissimilar from the debt we owe increasingly to the natural world itself. But I find the chimpanzee story is a good way into that larger story." "They are such characters. They all came to life in this book as individual characters and that's the point — that each chimp is an individual being. They have personalities and moods and friends and enemies and their allegiances are always changing. When I try to talk about the chimps, I usually start talking about Tom. He was the senior member of the group. Tom was the first chimpanzee to actually submit to human care at [the sanctuary]. When the chimps arrived at the sanctuary, they weren't sure if they were just at another lab. By submitting an injury he had to Gloria, who runs the sanctuary, to be cured — the other chimps saw this and they started to warm up to Gloria and her staff." "In chimp society when chimps get into an argument or a fight, one of the most important parts of that fight is the reconciliation that occurs afterwards. It's a way of signaling to the rest of the troop that the dust has settled that an alliance has been reformed and that we can go on with our daily lives. Now that's maybe not forgiveness in the true human sense that we think of, but perhaps it's a start down the road towards forgiveness. The most important thing to realize the humans [at Fauna Sanctuary] are doing so much to redeem us, as a species, for what we've done to the chimps." Andrew Westoll's comments have been edited for length and clarity.